This marvellous structure, built by the Knights of St. John of Rhodes over an existing Seldjuk castle in 1402, served for a very long time as a Christian bastion at the edge of Ottoman territory. Defended by Knights from across Europe, the castle was finally seized by Suleyman the Magnificent during his conquest of Rhodes. 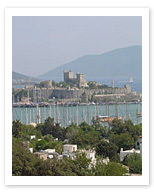 The Underwater Archaeology Museum housed inside the castle makes it worth visiting, rather than simply admiring from afar, which is a pleasure in itself, a truly spectacular and massive medieval sight jutting out into the blue Aegean, ringed by pine-covered mountains and colorful sailboats.